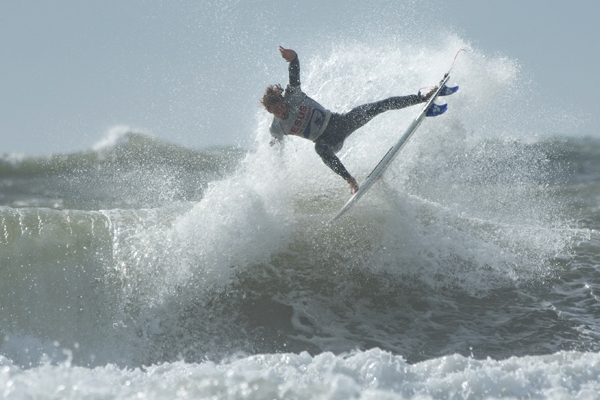 25th Anniversary Jesus Surf Classic event a huge success despite challenging winds throughout the weekend. Conditions for this years 25th Anniversary Jesus Surf Classic from a week away always looked as though they would be challenging, and so it proved, but despite that it was a hugely successful event. 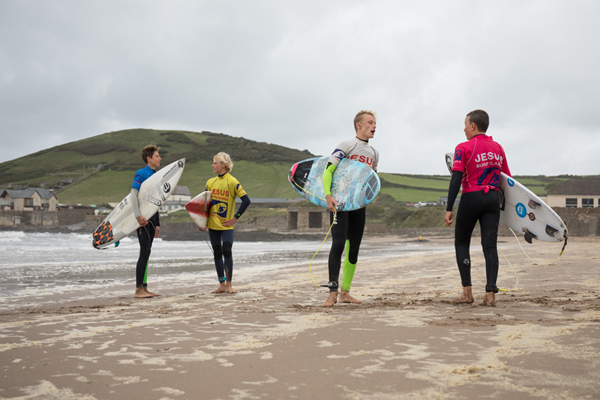 Organisers Christian Surfers UK have been putting on this event at Croyde Bay, North Devon, on an annual basis, attracting many of the UK finest surfers. This year was no different, with over 150 places filled to compete in the 8 categories. In an attempt to encourage the reduction of plastic use at the event, every competitor got a commemorative mug, with drinks discounts if they used them for tea, coffee or water refills. Due to the stormy conditions predicted, especially on Sunday afternoon it was evident that the 63 scheduled heats could not be completed, so contest organiser and head of Christian Surfers UK Phil Williams, made a decision along with his team on Wednesday to omit the U12’s, U14’s Boys/Girls and U18 Girls from this weekend, a wise decision! Instead those categories will be held, conditions permitting on 30th September, at the same venue. Conditions on Saturday morning started off in blustery 3-4ft North Westerly winds, and first heats for the 100+ competitors got underway at 08.30. Double peaks were the order of the day for the first few hours, to ensure the event was completed by midday on the Sunday. 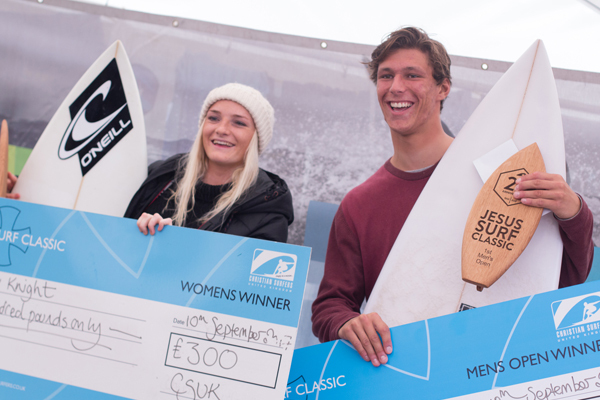 Quality of the competitors was outstanding with many of Britain’s top surfers competing in all categories, and with £300 for the winner in both men’s and women’s there was lots to compete for. For those not in the water, the big marquee was an ideal shelter from the wind, with refreshments, home made cakes, BBQ, live music and Crepe, and the great community spirit of the contest continued all day until 4pm, with only the 11 heats to run on the Sunday left. The stacked Open Semi finals, witnessed some amazing surfing in a building swell, losing previous winners Joss Ash, Jobe Harris, as well as Kit Innes & wales Logan Nicol. Day 1 ended, with far less rain than predicted and lots of smiles, even from those that were sadly knocked out. Sunday morning dawned with the storm predicted to kick in just after lunch, wind had switches to South Westerly, surf in the 3ft range but both Surf and swell predicted to increase rapidly. 11 heats later, the final hooter sounded and the rains came down, Gods timing or co-incidence? In a packed marquee the five categories were announced, as well as a speciality ‘Phil Pechonis’ memorial trophy awarded to Jo Morris. Christian Surfers member and Ex Aussie Dave Kemeny, now living in West Wales shared about his faith briefly and why he has served this event for so many years, before Phil announced the winners. It was a North Devon double victory in the Open Divisions, with Peony Knight taking the ladies division, ahead of Emily Currie with two solid scores, and Will Bailey retaining his Men’s title in a tight head against Stu Campbell making a rare return to the UK after spending the last few years in Australia. In the Junior divisions, competition was equally tight, and in the U18 Men’s, South Coast Noah Capps, just took the title by 0.10 ahead of Kit Innis, and in the U16, normal business was resumed with Stan Norman taking yet another title, in preparation of his trip to Tokyo representing England in the Junior World Surfing Games. In the always hotly contested Masters division (Over 35’s), there was a new name on the trophy with Rob Watson, taking the title, trophy and cheque ahead of Welsh, South African import Ingemar Cressey. For a full list of the results, and photo gallery head to www.christiansurfers.co.uk or facebook page Jesus Surf Series CSUK. Christian Surfers would like to thank so many people for making this event and previous years, such a huge success, and these include RNLI, Parkdene, Hotdoggers, the huge army of Christian Surfers volunteers from around the country, Si Cotter (Video edit), Andy Holter (Photographer), the cake makers, and local church, Chris Clark (Daily bread surfboards, for some amazing trophies, and a special thanks to the competitors, and spectators, and obviously a big thanks to God for waves and the ocean that we can play in.